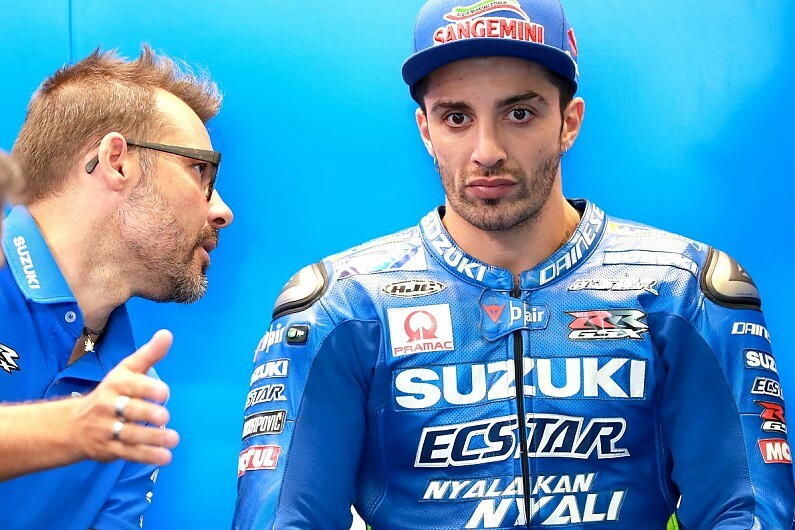 Andrea Iannone has hit out his Suzuki MotoGP squad for what he perceives as preferential treatment towards team-mate Alex Rins. Iannone, who is switching from Suzuki to Aprilia next season, criticised the team over the fact he and Rins are running two different chassis variants at the Red Bull Ring this weekend. Rins is using a new frame he sampled in Brno testing, which was not originally intended to be used in Austria and that Iannone has not yet had the chance to try. After qualifying eighth at the Red Bull Ring, two places ahead of Rins but eight tenths behind polesitter Marc Marquez, Iannone could not hide his frustration at the situation. "We have a bike with many limits that are very evident here," he said. "In the second part of the championship we hoped to improve those limits, but nothing. "It's not that I expected a lot. But there is a chassis evolution that Alex Rins is using and I am not. "I believe that when you are a factory rider, you try to work as professionally as possible, and you hope to have the parts that make the bike faster. "My motivation is not lacking, but it is not in my hands anymore. Two years ago I did the record for the track with the pole and now I'm a second slower." Suzuki team boss Davide Brivio responded to Iannone's comments by saying that the chassis case was a "special one" and that the team endeavours to treat its two riders equally. "The support is the same for the two riders," he said. "If we talk about professionalism, it's hard to say that Suzuki does not be have professionally. "Everything that is available and can give us an advantage will be available to the two riders. "Andrea complained in Brno that he did not have the [new] fairing, but he had it - he fell [during the post-race test] and it broke. Then Rins discarded it and we did not homologate it. "The case of the chassis is special, it was only [planned] to do the Brno test and send it to Japan. We only have one. "We will try it again in a new test, but at the moment we do not think it was a big step, that's why we have not produced more."